In case you're wondering what I'm talking about... Readercon is an annual fantasy and science fiction convention held outside of Boston that focuses exclusively on literature (in other words, no Stormtroopers were harmed in the making of this convention). 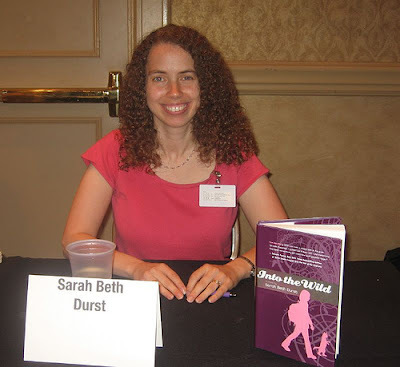 I was a program participant and scheduled to appear on two panels, give a reading, sign autographs, and hold a kaffeeklatch (a "meet the author" hour). It's a small convention but extremely well-run. The Name Badge. I LOVE having a participant badge. For Readercon, participants had an orange stripe at the top (other people had green or maybe it was blue -- I didn't even notice because I was far too enamored with my orange stripe). It's like wearing a sign that says, "Come talk to me!" Except if you actually wore such a sign, no one would really talk to you because you'd look like, well, totally crazy. Anyway, the orange stripe gave me the courage to talk with lots and lots of very awesome people. Panels. I was on two panels at Readercon. I LOVE being on panels. I am the perky puppy of panels. I stare out into that audience and all I can think is, "People! Looking at me! Listening to me! Yay for people! I love people! You! I love you! I love you all!" I try very, very hard not to bounce up and down in my seat... which reminds me of the other cool thing about Readercon: instead of the normal chairs with a table in front of you, you have these comfy throne-like chairs, a coffee table, and microphones! It totally feels like you're on Inside the Actors Studio with James Lipton. Friday night, I was on a panel with Holly Black, Michael J. Daley, Nina Kiriki Hoffman, Sharyn November, and Elizabeth Wein called "Young (and Very Young) Adult F&SF," in which I revealed that I began working toward publication at age ten after becoming increasingly concerned that I was double-digits and still lacked a career goal. And Sunday, I was on a panel with Steve Berman, Holly Black, Kelly Link, and Sharyn November called "After Rowling and Pullman," in which I revealed that I like fantasy books because I want to wake up one morning and discover I'm really the Princess of Unicorns. Kaffeeklatsch. I had steeled myself for no one to show up to my kaffeeklatsch. After all, INTO THE WILD just came out. Who would come? I'd decided that if no one showed, I'd just call my husband on the cell phone so at least someone would talk to me. [sniff, sniff, whimper] But people came! Michael and Nomi Burstein, Ryan Freebern, and other awesome people who I'd just met that weekend... I had a full table! We even needed to pull over an extra chair. And we had a very cool conversation about fairy tales. The hour flew by. On Saturday night, I participated in a game called Mafia, in which a bunch of people are designated... okay, I'm not going to explain the rules here. Google it if you're interested. Anyway, it was entirely Nina Kiriki Hoffman's fault that I played. And Holly Black too. Since I'd never played before, they both felt it necessary to my full-convention experience. Peer pressure was used. But I've forgiven them since it was fun and I met many (yes, the word is coming again) awesome people. Lots of Awesome People. The person with whom I spent the most time at the convention was Holly Black. She pretty much defines awesome -- fun, smart, sweet. I'm very happy that I got to spend time with her. I also got to chat for a bit with Wen Spencer, author of the very cool TINKER books. I met her at a Boskone a number of years ago, and she's really great. Also talked several times with Victoria McManus, Laura Anne Gilman, Jim Freund -- all super-nice and super-fabulous people. And Steve Berman, who is both sweet and hilarious. I am not even going to attempt to mention everyone who I talked to. Emboldened by the orange stripe on my name badge, I pretty much talked with anyone who was foolish enough to meet my eyes, including a few who weren't even connected to the convention but were merely unlucky enough to step into the elevator with me. Except the clown. I did not talk with the man dressed as a clown in the elevator. Clowns in elevators kind of freak me out. Anyway, if I met you at Readercon... so great to meet you! You're awesome! I look so insane there. I just want to say that it's incredibly silly to imagine you'll wake up one day and find you're princess of the unicorns. Because when the unicorns finally acknowledge their princess, it's gonna be me. It was great seeing you too! I had a fun weekend. Sean: You're so sweet. Thanks! Erin: It was totally fabulous. I've clipped my name badge to my desk lamp so that I can look at my Orange Stripe of Glory all the time. Ryan: Ditto! Hope to see you again at an upcoming convention. BTW, I just glanced at your sidebar. It needs to be updated! It still says ItW "will be published in summer 2007" and stuff. Was marvelous to see you bring out Holly's insanity.